If you have a child who is picky about eating vegetables, here is a solution that worked with our family. I started making fritters using shredded or grated vegetables. The second solution was to alter a zucchini or banana bread recipe and add a variety of shredded veggies to it. The fritters are a no-measuring style of recipe, one of my favorite types! I take an assortment of vegetables and shred them. One of our favorite combination of veggies is 2 zucchini, 2 yellow squash, 1 large sweet potato, 1 medium onion, and 3-4 carrots. Shred all of the veggies into a large bowl. Stir well to blend them. Stir in enough flour to lightly coat all of the vegetables. Add enough eggs to moisten the vegetables. For the amount of veggies that I listed here, I used about 3/4 cup of flour and 5 eggs. The amount will vary depending on the volume of vegetables that you have. Heat a skillet and spritz with a non-stick spray. Drop mixture by spoonfuls onto the hot skillet and flatten slightly. Reduce heat to about medium low. Cook on one side until the fritter is very firm and golden brown. Flip over and repeat with other side. Cooking over a medium low heat will allow the inside of the fritter to fully cook before the outside becomes browned. If you wanted, you can add a bit of protein powder to the mixture along with the flour. Milled flax seed is another option to add also. These will increase the nutritional value of the fritters even more. Having picky eaters, this is one area that I try to address daily. I really have no true “recipe” for this. It is simply an alteration of your favorite zucchini or banana bread. Make the bread batter as you typically would. Next add a good sized handful of the shredded vegetables you have on hand. Some really good ones to include are a variety of squash, sweet potatoes, and carrots. I mix in enough that the batter looks like more vegetables than the actual flour batter mixture. Bake according to your recipe’s directions. Either of these ideas are fully adaptable to whatever you may have on hand. If you garden, then you have a ready supply of fresh produce to choose from. If the kids get to help pick out garden seeds and grow them, often they will be more likely to try eating them. As for our family, hiding the veggies in things like the cake or making them into fritters will get the kids more than willing to eat their veggies. On Tuesday, the kids and I started a “He is Risen” garden. This is based on an idea that I saw on a facebook homeschool group. The project is a simple one but will be pretty at Easter. I also love that the kids will be able to watch as the seeds sprout and grow. 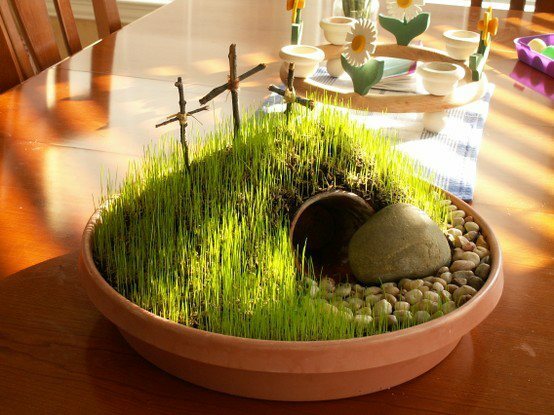 If you would like to make one for Easter season with your little ones, start soon as it takes about 10-14 days for grass to grow from seed. Pic that was shared on the message board of a finished garden. For the garden, you need a large saucer like those used for potted plants, a small flower pot, soil, grass seed, small twigs, dental floss or thread, large flat rock, and a spray bottle of water. We used soil from our yard for this project so that we could better form the shape of the garden landscape. To begin, place a small layer of soil in the saucer. Lay the Small flower pot on it’s side. Finish filling the saucer with soil, mounting it over the flower pot to form a hill. Be sure to keep the inside of the flower pot empty. After the kids formed the landscape, they next will spray the soil with water to make it easier for the grass seed to stick to it. Scatter the grass seed over the soil. The kids went a bit nuts in this and left no soil showing! LOL After scattering the seeds, mist again with water to dampen the seeds. Place in a sunny location. Have the little ones spray the garden with water several times a day to keep seeds moist. Over the next couple of weeks we will be adding the rock in front of the tomb (empty flower pot) and making 3 crosses from the twigs and thread. We are going to be working on a devotional about the Easter story. The kids will be placing the 3 crosses on the hill behind the tomb. It will make a nice visual of the garden scene. On a science note: the kids will be able to watch the growth of the grass from seed. Every couple of days, as they take turn watering the seeds, they can observe the changes. If I were to do this project again, I might consider using an old spice bottle with shaker lid to sprinkle on the grass seed. It would be less messy and the kids would use far less seeds. After the garden was set in the sun, the kids had fun scattering the leftover grass seed over the thin spots in their play yard. They have looked forward to this project and getting to toss seeds across the yard was an extra bit of fun for them. I have been collecting lapbook ideas, worksheets, and little booklets for the kids on the topic of a plant life cycle. With the garden season quickly approaching, it is time to begin the unit. Here are some easy activities that we will be doing. 1. Starting a couple of seeds in a baggie with a damp paper: Hung in a sunny window, the kids can watch as the seed sprouts. They are able to observe the growth of the roots and stem. 2. Planting seeds in 2 different conditions: In 2 little cups, plant a seed. Water one and do not water the other. Place both cups in a dark area and see what happens. In 2 more cups, plant a seed. Water one and leave the other dry. Place these in a sunny window. After the first plant begins to grow, take all of the plant cups and compare the differences. What difference did light and water make in the seeds’ growth? 3. Make a lapbook of the life cycle of a plant. Have a picture of a plant with it’s parts labeled. Include a little booklet showing the various parts of a plant with its function (i.e. roots draw nutrients from the soil to the plant) recorded in the booklet. 4. Using a white carnation, split the long stem in half along it’s length. Using food coloring, color water in 2 glasses red and blue (or two other colors of your choice) and place one half of the carnation stem in each glass. The children get a great lesson in how the stem draws nutrients up like a straw from the roots to the flower. The results is that one portion of the white carnation will turn red and the other will turn blue. It is an excellent illustration that they will remember for a long time. 5. Make homemade seed paper: Make homemade paper using torn up paper scraps that have soaked in water overnight to soften. Be sure to use plain paper or a paper that has soy ink and not a chemical ink. Toilet paper or paper towels works great! If you happen to use a clothes dryer, you can add dryer link to make the paper stronger. Using a piece of netting fabric stretched on an embroidery hoop, pick up the paper from the slurry (paper pulp & water mixture) in the bowl. Let drain. Press out as much water as possible using a sponge. Gently remove the paper from the netting by placing it on a towel and peeling back the netting. While the paper is still damp, sprinkle on a few wildflower seeds. Let the paper dry. Once dried, the paper can be used to make a card or can be planted into the garden soil. The paper is biodegradable and will break down, the seeds will sprout and grow. 6. Make a carrot window planter: Using 2 pieces of plexiglass and some 1″ x 2″ wood strips, make a little planter. The wood strips make 3 sides of the frame. Place a strip of the wood along the 2 short edges and 1 long edge of a piece of plexiglass. Glue into place to hold it together. Add the second piece of plexiglass to the other side. Clamp together and let dry. Make “legs” for the bottom on each end with scraps of wood. leaving the open end of the planter facing up. Fill the planter with potting soil. Plant a few carrot seeds, parsnip seeds, or radish seeds (or a combination of these) along the planter. The kids can watch the root vegetables grow through the “window” of plexiglass. 7. Growing sweet potatoes: I have written about this process before. You cut a sweet potato in half and place cut side down in a tray of water. The sweet potato will grow sprouts. When the sprouts are about 5 inches tall, carefully snap them off at the potato. Place the sprouts in a jar of water to take root. Once they are well rooted, you can plant these “sweet potato slips” in soil and grow your own sweet potatoes. The kids will be planting the slips into large buckets of soil to grow their own sweet potatoes for autumn harvest. Along the way, as we work on this science unit, I will be taking pictures for adding to the lapbook. At this point, the lapbook will look more like a small nature journal. It will be a lengthy project that will last for several months. For the kids, it will also be a lesson in how to have patience and see a project through. We love sweet potatoes more than regular russet varieties. So, with that in mind, I am going to buy a few sweet potatoes to grow into slips for the garden. Growing your own sweet potato slips (the little plants that you later will transplant in to your garden) are simple to grow. You can cut sweet potatoes in half and place them cut side down into a tray of water. Allow the sweet potatoes to sprout in a sunny window. When the sprouts are about 4-5 inches tall, carefully break them off of the sweet potato and place in a jar of water to take root. These are called “slips” and are the little plant starts that you have to buy to grow sweet potatoes. I am going to let the kids grow their own sweet potatoes this season. Each will have their own little slips that they have watched over all winter. 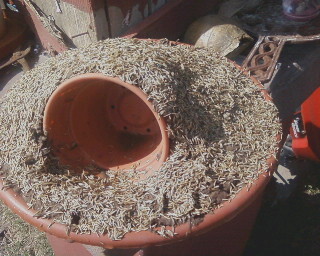 When the slips have grown enough roots to be planted, we will plant them into 5-gallon sized buckets. 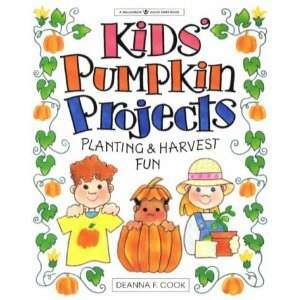 When harvest time comes along, the kids will get to empty their bucket and see how many sweet potatoes they have grown. I will be growing some myself in the family garden also! It will be fun for the kids to see where their sweet potatoes come from.